Here is nice news for those candidates who have appeared in the BSNL Junior Accounts Officer Exam 2017. The Bharat Sanchar Nigam Limited is all set to declare the BSNL JAO Result 2017 on its website. A large number of candidates have appeared in this exam that was organized on 5th November 2017 (6th November for few circles). After appearing in the exam, candidates are willingly looking for the BSNL JAO Merit List that will be declared soon by the conducting organization. With the intention of getting success in this recruitment exam, a large number of applicants have attended the test at various examination centers. Now, they all are looking tensioned about the result, cut off marks and merit list of this exam because these are the important fact for the selection for the next round of this recruitment process. Such candidates are suggested to stay in touch with us because as the organization releases any official notification regarding this exam, we will let you know by describing on this page. Moreover, read the complete page to know more on this examination. In September 2017, the BSNL JAO Recruitment Notification 2017 was publicized by the Bharat Sanchar Nigam Limited for the recruitment of talented suitors on 996 vacancies of the Junior Accounts Officer in the authority. To job seekers, who were looking for such job opportunity in the BSNL, have enrolled under this job advertisement. Afterward, the organization has directed a recruitment test on the given dates. Those, who have taken this exam, are now in the hunt of the BSNL Junior Accounts Officer Merit List that will be made available online very soon. The BSNL JAO Exam Cut Off Marks are very important for those candidates who are really serious towards this advertisement. After declaring the results, the department will be releasing the qualifying marks for General, SC, ST, OBC and other categories. The aspirants, who will qualify according to these marks they will be eligible for the next round. Applicants will be able to check the cut off marks from this page. To check your result easily, please put your eyes on the below given simple process. At first, open the official web portal i.e. www.externalbsnlexam.com. Check the Section of “Advt. No. 10-1/2017”. Under the “Status” section click on the result link. Now, you will be queried few details about you like roll number, date of birth, application number etc. Enter the details properly and click the submit button. 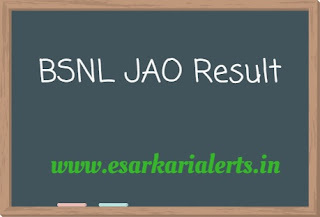 Thus, you will be able to check the BSNL JAO Result 2017. It is better to take a printout of your result because it may be used in future.